WHERE IS SALAD KRAZE LOCATED AND HOW DO I GET THERE? We are located on the corner of Pin Oak Parkway and Avon Belden Rd (Rt 83) in Avon Lake. 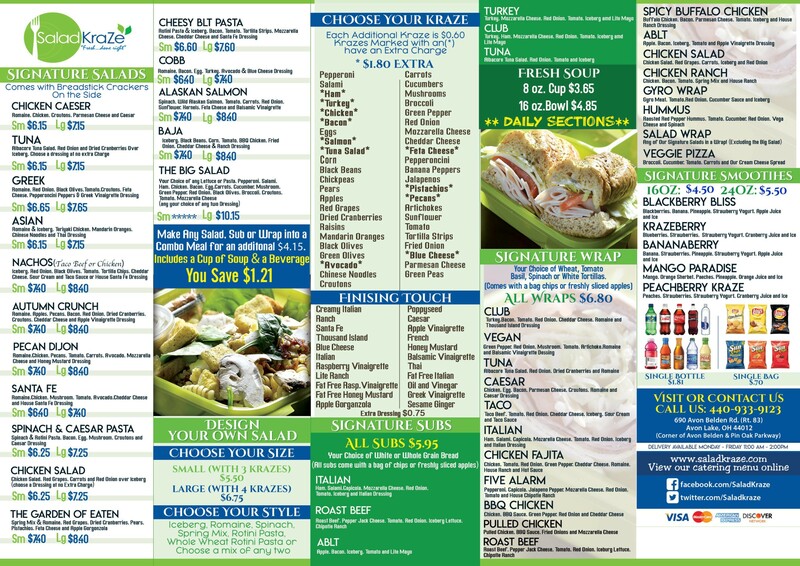 WHERE CAN I DOWNLOAD OR PRINT OUT A COPY OF YOUR MENU? You can view a copy of our menu here. If you are unable to download the file, please use the four links located at the bottom of the home page. They are titled ‘Salads’, ‘Soups’, ‘Subs’, and ‘Wraps’. DO YOU DELIVER? IF SO…WHEN? Absolutely! We deliver Monday-Friday 11am-2pm (Delivery is not available on Saturdays and Sundays). WILL YOU DELIVER TO MY JOB AT A SPECIFIC TIME? This is our specialty! We will do our best to get your order to you at a specific time. The only thing we ask is that you call in your order as soon as possible (we start taking orders at 10am). Time slots are filled on a first-come first-served basis so call early. We accept all major credit cards (including American Express) and cash. We provide receipts for all orders. WHERE CAN I FIND OUT MORE ABOUT YOU AND YOUR BUSINESS? WHO WOULD I CONTACT ABOUT PLACING A LARGE ORDER FOR MY EVENT? You can contact Scott Rush (owner) at (440) 933-9123. He will be happy to answer any questions you may have.